Red Bluff viewed from the beach. As one leaves behind Elwood and Brighton, the coast becomes more rugged and the scenery more interesting. This ride from Brighton Beach to Edithvale is an opportunity to explore this area, following the coastline and then turning inland to see some of the wetlands further south. Initially the ride goes alongside the beach on top of the cliffs, first with panoramas of the marina at Sandringham and then offering tantalising glimpses of the beach below. Openings next to the trail allow one to get a closer view of the scenery. After passing Sandringham you might like to take the opportunity to go down to beach level to see some of the cliffs from below. 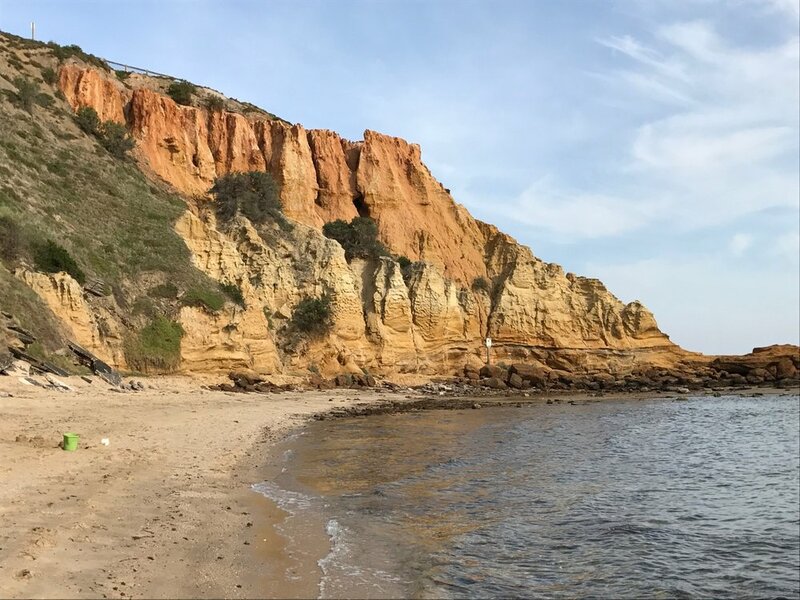 Opposite Edward Street, you can visit the beach on foot to see the views of red bluff from the north. But the most accessible route is down Cerberus Way on a sealed road to see the views of Red Bluff to the north and other cliffs to the south. There is a cafe here on the coast. You will continue along the coast to reach Ricketts Point where there is a teahouse. Here there are very accessible rock pools teaming with marine life. If the tide and the weather are right, this is an enjoyable place to explore. The ride continues on the cliff tops to Mentone Lifesaving Club where it drops down to the beach. You ride right next to the sea on a shared promenade – what a delight. From Parkdale to Mordialloc you ride on an unsealed path through bushland. After admiring the marina and creek at Mordialloc you turn inland visit Edithvale Seaford Wetlands and have an opportunity for bird watching at the bird hide near Edithvale Road. There are two bird hides. A smaller one is open to the public at all times. The other, a more professional double storey hide, is open on weekend afternoons and, during summer, on Wednesdays at dusk. WARNING:If it has been raining a lot, or is a wet winter or spring, you are advised not to do the leg from Mordialloc to Edithvale as this becomes very muddy. There are cafes and toilets at Rickets Point, Half Moon Bay and Mordialloc. The ride is most flat but there are some undulations. Some of the route is unsealed. WARNING:If it has been raining a lot, or you are riding in an especially wet winter or spring, you are advised not to do the leg from Mordialloc to Edithvale as this becomes very muddy. Approaching Mordialloc on Bay Trail. Exit from Brighton Beach Station and make your way over South Road and Beach Road to find the shared Bay Trail on top of the cliffs. Turn left and ride along Bay Trail next to Beach Road until you reach Ricketts Point. Remember after Sandringham is where you can explore the beach by going down the path opposite Edwards Street, or by riding down Cerberus Way. At Ricketts Point the path winds in and out of the foreshore reserve with a couple of undulations. Continue south along Bay Trail to Mentone Life Saving Club. Just past Mentone Lifesaving Club, you will see a signpost with an arrow labelled “Bay Trail”. Take this route down to the beach level. Follow Bay Trail along the beach to Parkdale where it climbs up to an unsealed path. Follow the unsealed path into Mordialloc. Stay close to the beach until you are almost at Mordialloc Creek. You should see a parking area and toilet block on your left. Ride through the parking area and pick up a trail right next to the creek. Follow the creek around and under the railway line to a pedestrian bridge. Cross the creek and turn left onto the bike trail. Follow the bike trail as it passes behind houses and past Rossdale Golf Club. Do not take any of the turns to the left or right. Eventually you reach Edithvale Road at a pedestrian/bike crossing. Cross the road at the lights and turn left alongside the road. In 50m, after crossing the drain, you will see a car park on your right. This leads to the bird hide. After exploring the bird hide, exit from the car park and turn left. Ride along Edithvale Road, first on a shared path and then, after Bridges Avenue, in the bike lanes to Station Street. Edithvale Station is on your right. combining it with Braeside Park. After visiting the bird hide follow the instructions for Braeside Park.